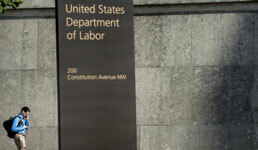 The Department of Labor’s fiduciary rule may have been dead for months, but the majority of financial advisors are still planning to make various changes to their practices as a direct result of the Obama-era regulation, according to a recent survey cited by InsuranceNewsNet. The rule purported to require retirement account advisors to put clients’ interests first and went into partial effect last year, only to get vacated by an appeals court in March. Nonetheless, only 14% of advisors aren’t likely to increase compliance infrastructure as a direct result of the rule, according to a survey by LIMRA and Ernst & Young cited by the insurance news website. Fifty-four percent are very likely to boost compliance infrastructure, meanwhile, and a further 32% are somewhat likely, according to the survey, which polled close to 1,500 advisors, InsuranceNewsNet writes. In addition, 74% of advisors say they’re very or somewhat likely to see more customized financial or retirement planning at their practices due to the rule, and 73% say they’re somewhat or very likely to see changes to their rollover strategy, the survey found, according to the website. But the fears about the DOL rule long voiced by its opponents — namely, that it would prevent advisors from serving certain clients— appear alive and well even though the rule is no longer in effect. Fifty-four percent of respondents say they’re very or somewhat likely to see a reduction in the total number of clients served, and the same percent believe they’ll see a reduction in less affluent clients specifically, according to the survey cited by InsuranceNewsNet.